Deep winter. Stillness, death, darkness and also deep wisdom. It is a time when our inner teacher is so much closer to us, only a breath away. She demands that we surrender to her to receive her wisdom. To acknowledge our need to slow down, nurture ourselves, breathe. The antithesis of what modern life insists on; that crazy round of parties and shopping and driving to visit people when our bodies ache for rest and home. For years I despised winter. I was more comfortable with the maiden aspect of myself – active, dynamic, busy getting things done. Menstrual cycle awareness (spiritual practice and the menstrual cycle) has taught me so much. Now I intimately know the rebirth that is intrinsic in every bleed I surrender to. I know that by following the call of my body each month I am healthier, stronger, more able to create the life and the world I desire. So it is with the seasons. I am welcoming the invitation to slow down and go within, trusting that the new shoots will emerge when they are ready if I can only gift myself this downtime. This is this the wisdom of the crone. That my inner teacher knows what is best for me. That no guru or teacher can know my bodymind as my higher self does. That all I need do is go within. This is my invitation to you whenever I work with you. I hold the space for you to go deep inside yourself and find your own inner guidance, your heart, your soul. As beginners we need steps to follow. As I made my first tentative steps as a coach I had a process to follow. It felt clunky and awkward but with practice it became smooth and effortless until the process itself dropped away completely, leaving me open to presence and intuition, to the magic of being in the moment with no expectation, no rule book or steps to follow but simply being with what is. This is the place where miracles happen, where lasting transformation can come from a single moment. I have trusted my higher self to guide my work for years. She constantly challenges me with apparently random inspiration that is always exactly what my client needs in that moment. Outside of my work I have been less courageous. Some days I am able to let my soul take the lead but often I am pulled back into the minutiae of the mind – the deadlines, the clock, the “have to’s” and “should do’s”. Yet recently a wise woman inside has been courting me. Whispering to me that she knows the way. That I can drop it all and instead fall into a place where I can allow and receive. Where there is flow, effortless inspiration, where everything happens in its own perfect timing without me having to make it come about. This might sound passive. It is absolutely not. It is like getting used to living on a knife edge in the constant unknown. Living in the mystery, not needing to work it out or to understand. So it is with our spiritual practice. Once we move beyond being beginners at yoga or meditation or whatever calls us can we trust that the soul knows the way? Can we surrender and follow her lead? Throw the rule book out of the window that says spiritual practice should look a certain way or include certain things? Can it simply be a vessel for expressing ourselves as divine beings? The body always knows what it needs to unwind and reconnect if we can only take the mind out of the equation and keep our attention inside the body, in those cells that are being re-programmed as they bask in our awareness, as they move, reshape, realign through our movement. The inner teacher is there too, she knows when we need stillness and when it is time to move. When silence is the answer and when we need to roar and groan and release. All of this is holy. It is part of the whole, part of you. You are a divine being. Transformation is ripe in every moment when we are able to be fully present with what is. This is the gift of my work to you this winter. 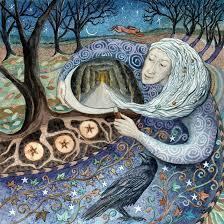 Give yourself time and space to hear the wisdom of the crone at home too. Take a walk in the woods. Withdraw to another room with your journal or some beautiful music. Take time to go within and dream. The benefits will last you not just through the winter but all year.